Austinites like to have a good time and the city is full of opportunities for free fun. After visiting and photographing almost all of Austin’s attractions for Austin Photo Book, I would like to pass on my recommendations for the top free Museums in Austin, along with a description of why each is worth visiting. The photos in this article all appear in Austin, Texas: A Photographic Portrait, which goes on sale in March of 2011. If you want to save this list to a mobile device, click here to save this tour as a Gowalla trip. My favorite free museum in Austin. Exhibits are constantly rotating in and out and they’ve had amazing photography exhibits come through including Ansel Adams, Frida Caillou, Fritz Heinle (one of the early LIFE magazine photographers), and an amazing retrospective on the history of photography. Also, they have the world’s first photograph and one of the only Guetenberg Bibles in the world on the permanent display! Tip: Parking is a little tricky – I park on the street on San Antonio Street and walk over – it usually takes about an hour to walk through the whole gallery. An impressive Presidential Library and museum in a huge modern space that covers American History leading up to and during the Johnson administration including exhibits on the Vietnam War, Civil Rights, the JFK assasination, and the space program. There’s even an animatronic joke telling LBJ robot. Both parking (on Red River Street) and admission are free at this, the most visited Presidential library in the country. You could easily spend a couple of hours here in the museum and walking the beautiful stretch of the UT campus it’s located on. This venue is worth checking out for the building itself – Arthouse was newly renovated in 2010 and now truly lives up to it’s name. The structure features a very modern concrete and glass exterior with glass tiles jutting out of the walls of the building. Come at the right time of day, and see these translucent tiles glow from the light of the rising sun or from the lights of the museum illuminating them from the inside-out. Arthouse also features a beautiful wooden staircase and a beautiful rooftop deck. It features prominent contemporary art, much of it sourced from the Austin community. The Carver Museum is a hidden gem located 3 minutes east of I-35. Here you can find beautiful murals, an exhibit on Juneteenth and prominent early African-American families in Austin. One of the coolest things here that I saw, was an exhibit on famous African-American inventors (like Dr. Carver himself) geared towards teaching young children that they can achieve anything they set their minds to. There are rotating art and history exhibits in the gallery in the impressive Center, and there are exhibits chronicling the life of George Washington Carver as well. When I was little, I used to love huge military machines – too bad I didn’t live in Austin back then to take pictures with the hundreds of tanks, planes, jeeps, helicopters at this cool museum that includes exhibits on the history of Texas based military divisions in various wars including WWI, WWII, and the Spanish American War. Perhaps the coolest pieces of military hardware at the museum are the Vietnam era F4 Phantom jet and Cobra attack helicopter, which are both sitting near the running track and visible from the Mopac expressway. You will have to pass through a military checkpoint base so make sure to bring your photo IDs. The Nature and Science Center is great for kids and families. 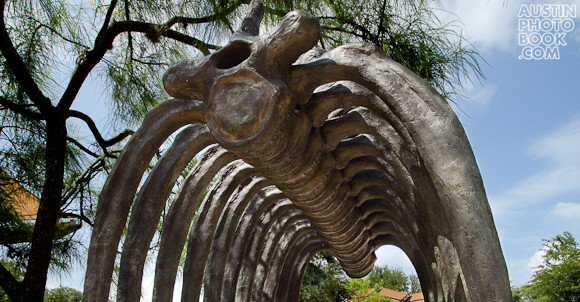 The attraction includes mini zoo full of native Texas species, giant bronze dinosaur ribcage and the Dino Pit where kids can dig for “fossils”, and a learning center. The center also hosts temporary exhibits that rotate on a regular basis (At the time of this writing, it was the NASA funded “A View From Space”). Best place to park is under the Mopac Bridge along the Hike and Bike Trail (Stratford and Mopac). Elisabet Ney was a gifted artist that sculpted works depicting European royalty and celebrities, and the distinguished men Texas including Ludwig II of Bavaria, Otto von Bismarck, Richard Wagner, Sam Houston, and Stephen F. Austin. The museum is housed in Elisabet Ney’s former studio, named “Formosa.” Inside, visitors can find dozens of her sculptures and get a glimpse of life in the 1800’s. 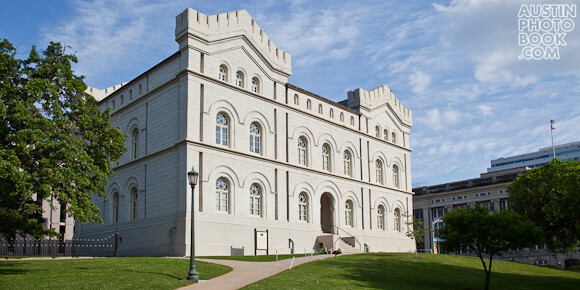 Ney’s other works can be found around Austin, including in the State Capitol and at the Center for American History. A really great Natural History Museum complete with Dinosaur bones here in Austin?!? That’s what I thought when I first visited the Texas Memorial Museum. This not often advertised museum has a complete flying Pteranodon (like a Pteradactyl) skeleton and this pictured 30 foot long Mosasaur skeleton, found right here in Austin’s Onion Creek. Additionally, you can find displays with specimens of wildlife on par with many better known museums around the nation, get up close and personal with rocks and gems, and see other types of prehistoric life. This is a must see for the kiddies. Located just next to the State Capitol, this landmark is easy to pass by unless you are looking specifically for it. This great little Museum that has exhibits on early life in Texas, a cool cutaway model of the interior of the Capitol Dome, interactive exhibits, historical photos, and my personal favorite, a nice view of the capitol from a higher viewpoint. If you are looking at the front of the State Capitol from the main gate on 11th St, turn to your right to see the Capitol Visitors Center. More Austin Attraction Posts to Come! Thanks for reading, and be on the lookout for more posts like this one in the future. If you are wondering what other attractions will be in Austin Photo Book, there’s an extensive list in the right hand column. Also, remember that all of these great photos will be available in the Austin Photo Book, scheduled to print in March of 2011. The photo shoots for the book, Austin, Texas: A Photographic Portrait have concluded and the editing has begun. We have a great editor, writer, and photographer working together in unison to bring you a book that truly represents Austin. I’m looking at early proofs right now and the book looks awesome! I can’t stress how excited I am about bringing this book to market. Right now we are targeting March of 2011 for the first printing. Just to reiterate, the book will be a beautiful 128 page, full color, hardcover book that includes photos from the Austin, Texas are spanning the years between 2008 and 2010. Thanks for visiting the site and be on the lookout for more updates soon!